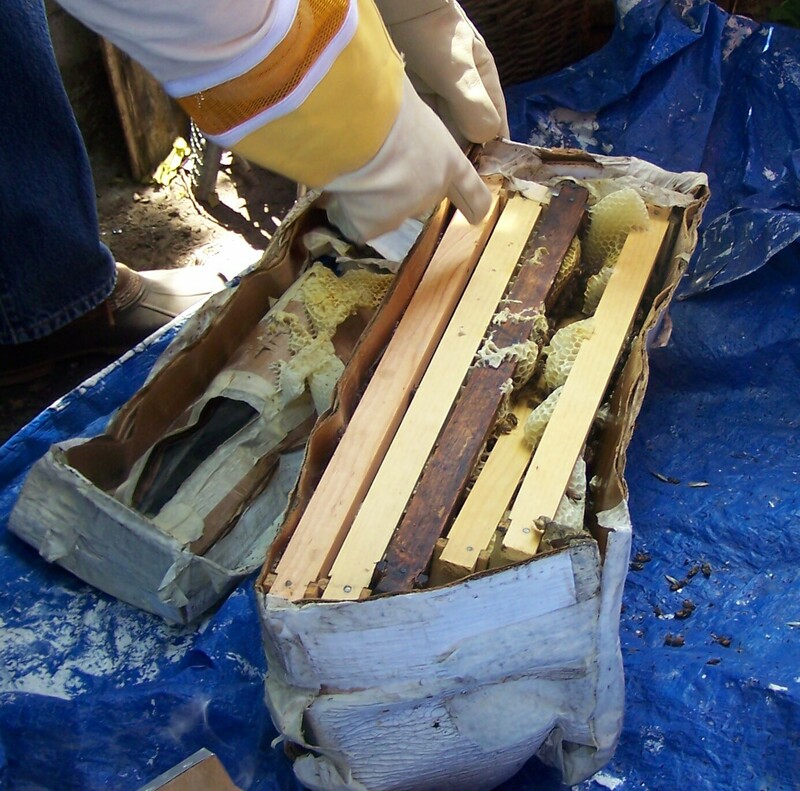 This is the state of my first hive of bees when I first got it from Kirk. The outer cardboard box is pretty well shot, the five frames have wax, honey, brood and - gulp - live bees all over them! I have a little free time to write even if it is painful - I fell yesterday (playing with the dog!) and have either broken or badly strained my left wrist. I'll know later today, although the prescription is much the same no matter which it is - a strain would heal a lot faster. I'm already trying to figure out how I'll play with the band. I could play keyboard with my right hand only, but I'm not going to be fretting anything soon! Kirk was telling me how to deal with the hive until he asked me what size of hive I would be using. "I have a top bar hive," I said, proud of my unconventional choice. Kind though it was, the look in his eyes - and his silence - told me all I needed to know: "Your on your own, buddy!" I laughed. I understand that too. Traffic made me late getting back to my environs and by the time I got back I was late to band rehearsal - this is before the fall, right?, and so the bees stayed put until after rehearsal - it was about 7:00 PM when I got to the undisclosed location of my empty hive (keeping bees is not legal in Los Angeles yet - although I think my location isn't in Los Angeles, I'll just obfuscate for the hell of it). I have been a gardener for many years and I know that nature pretty well will take care of herself if we don't mess with her too much, so I set things up in hopes the bees would migrate on their own into my top bar hive (TBH). I put sugar water and a pheromone scent in the hive, faced the opening towards them, opened the bundle and made sure it was shaded. I left them there to figure out their new home. And maybe even move into the hive on their own without any confrontations with me. Wednesday was my first day I could come back. I went over to The Learning Garden where my gear was at. I had never used any of these before on a bee hive - in fact, I have only been around an open hive once - Kirk had opened a hive at Solano Garden at a Backwards Beekeepers meeting - the only one I ever went to because I work when they have them. The open hive had scared me. At least one of the bees had repeatedly flown into my veil which I found really disconcerting and had to move away. But, fear has not often stood me in good stead - it has often hindered me doing that which I dreamed of doing and I was determined not to let this keep me from my dream of learning self sufficiency. I wanted to test the smoker - beekeepers use smoke to make bees more manageable and I didn't want to figure out how to use it with a couple hundred bees around me being unmanageable! More in Buzz II later this month! Have you kept bees? Do you want to learn how? I started with this book, The Barefoot Beekeeper. He's not really barefoot - it's metaphorically a way of saying it's more natural, less chemically and humanly oriented. So far it's the only book I've seen where top bar hives are explained in detail although the editing and writing could really use some higher standards. He does explain thoroughly and his style is truly worthy of imitation. It is also very British and he dabbles in Warre hives as well. In coming posts, I intend to use my hive, all I've read of this book, learned from other beekeepers I've found on the web and conversations I've had with a variety of experienced beekeepers on top bar hives. I'll explain why I chose top bar hives, why I feel TBH's are the hives most of us should have and share my experiences working on a bee hive filled with buzzing bees and honey and larvae and more stimulation than a quart of coffee!!! Well, Sam, that was part of getting rid of the cardboard box. I'll write more about the bees and what I did with them as soon as I can heal a sprained wrist. Top bar hives are in many parts of the world - I saw my first top bar hives in Ohio last summer and was hooked. They won't produce as much honey as other hives, but they are simpler and, in my estimation, the hive that most amateurs should use. They certainly aren't for everybody! And I like YOUR site - thanks for all that incredible information! I have read they produce almost the same as a lang system if you manage their honey space properly, this makes sense even the lang system they have to keep adding boxes under full ones to trick the bees into thinking they don't have enough stores for the winter. Anyway imho tbh is the only way to fly, less work = happier me.